Open doors to a new world – Detail! In everyday life details are unconsciously catched by our eyes – leaving marks in our memories- and from time to time we feel the urge to gå back to explore them further. 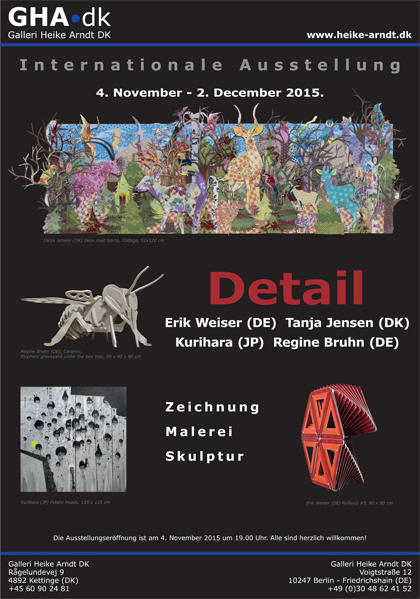 The exhibition Detail is about these discoveries – the richness of details – and encourage the viewer to thoroughly explore them in the works of Erik Weiser (DE) sculptures, Tanja Jensen (DK) collage, Regine Bruhn (DE ) sculptures, and Kurihara (JP) paintings and drawings. Visit dimensions far away from earth, the animal kingdom and be astonished over an insect stock or everyday objects transformed, changed and been given a new purpose. Every artist has their own distinct expression in this dynamic exhibition. From the diversity of style and technique a common universe emerges. Look at them closely and ponder over them! You will be able to distinguish in each piece a world of its own. The artists explore and push the boundaries of space and reality and challenge our expectations and preconceived notions.